St Mirren have a stadium more than worthy of the SPL. It has just undergone redevelopment work and looks better than ever. Love street is now both historic and modern. Exit the M8 at junction 29, and take the A726 Greenock road. The ground is approximately 1/2 mile along on the left. The floodlights make it clearly visible from some distance away. Love Street has been St. Mirren's home for near enough all of time, though I seem to remember we used a cricket pavilion at one point. OK, I don't actually remember this, it was on the 'Marching In' video. 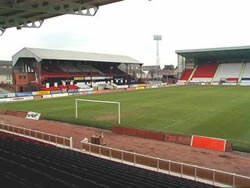 Anyway, during the 2000-2001 season Love Street, or St. Mirren Park to give it the official name, needed to be upgraded. As we had less than 10,000 seats, a requirement for the SPL, we needed a new stand. So, the final part of terracing at Love Street was taking down, and in its place was put a brand spanking new stand, partly funded for by a raffle. Well done to everyone involved in that. The stand is called The Paisley Daily Express Stand, after the local paper which sponsors it. The stand is meant to be the ground's family enclosure as well as for normal folk like me who have season tickets. Facing the pitch and walking left from the stand, you walk round to Carter's Corner, which was a very old family enclosure. I remember sitting there with my brother and dad for the first few seasons of our last spell in Division 1. With no roof or anything to protect you from the elements, its amazing what folk will do to save a few quid! I also remember one game when the stewards took pity on us during a hail shower and said we could move into the main stand. The hail was so bad that even the players went in for 5 minutes! For the final game of the 2000-2001 season, a band played here before the match, and there was also talk of a hospitality suite being installed, but this was aborted because of the need for wheelchair access to the PDE stand. The area will probably remain like this for a long time. Continuing 'The Love Street Tour', the next stand we come to is the main stand. This has such features as the dugouts, press box, announcers box, and the player tunnel. Inside the actual stand there are the dressing rooms, the boardroom, the trophy room and many more. The main entrance is also situated at the back of this stand. There is an enclosure just behind the dugouts, and also another tier, if you like, where most of the corporate hospitality guests go. Our next stop is the impressive Caledonia Stand, originally named because it is located on Caledonia Street. This stand was opened in 1994 and seats about 3200. Unfortunately, the best stand in the ground is reserved for the away fans, which is a shame. I have, however, sat in it about 6 or 7 times. A few of these times were for Scotland Under 21 games, while others were when Saints thought there wouldn't be that many away fans and let their own fans in. This idea was ended however, when most Saints fans preferred to stay where they normally went. Underneath this stand is the Sports and Leisure Complex. It features many facilities such as 5-a-side pitches, gyms and aerobic studios. For about five years on a Tuesday night I went to the Young Buddies Soccer Clinic, and I would encourage all young St. Mirren fans to join this, whatever day of the week. It is great fun. The final stand of our tour is the North Stand, part of which I will get to in a moment. The first part of the stand used to be for away fans, and is still used for them when the Old Firm come, and also when the Saints fans are allowed in the Caley Stand. Towards the end of last season school children were given free tickets and this was the part they sat in. The second part of the North Stand is the North Bank. This is where all the singing usually comes from, and is usually the fullest part of the ground to contain Saints fans. As with all the other stands it is all seated, but doesn't have any special features. It's just a normal stand (I'll get pelters for saying that) The total stadium capacity is somewhere in the region of 10,800 seated, with no one standing. I hope you have enjoyed this tour of Love Street and if you have anything to contribute then just e-mail me. If you are a registered user then you can login, and create your own personal review of St Mirren Football Club - Saint Mirren Park. These reviews can be private or public.